Artist Scholar is a well-presented and meticulously researched approach to an issue that is very much alive and increasingly important in terms of contemporary postgraduate art education on either side of the Atlantic. Despite the deliberate emphasis on the development of art instruction, and particularly the Master of Fine Arts (MFA) in the US, it becomes clear that Daichendt’s introduction of the idea of ‘scholarship’ as an overall term for art production, understood here as a ‘type of enquiry, reflection, commentary and thinking process that has transformed the way we understand the world and ourselves’, is global in its reach. Artist Scholar has particular resonance for me because, as an artist and researcher, I carried out my PhD in the UK in the early 2000s whilst the embers of the fire of the 90’s debate about the validity of practice-based work still smouldered. Even now, where the university has become the dominant source of art education opportunities, there still remain, as Daichendt points out very early on (p.5), ‘several lingering symptoms’ of the tension between practicing artists and university academics. Having completed my doctorate I am now a university lecturer in fine arts theory and practice and I am very much an advocate of the pluralistic nature of arts research and the role of reflective writing in it. I therefore appreciate and support Daichendt’s stated goals here, which seem to be based on the contextualising of art practice within the academic arena whilst at the same time not restricting its vibrant and restless nature with pedagogic methodology and academic legitimacy. As a series of essays, Artist Scholar need not be read ‘cover to cover’. Indeed the content of the separate chapters is often clearly aimed at different reader groups, these being defined in the back cover ‘blurb’ as those who might be ‘entering, graduating or employed by the contemporary art academy’. This equates nicely with the author’s overarching goal of offering ‘avenues of enquiry’ and ‘examples to teach, inspire and provoke thought’. The main body of the text sits comfortably between a well written and thought provoking preface by John Baldacchino, and two appendices that strengthen the book’s message by providing valuable examples of writing in and through art practice. Baldacchino sets the scene for the whole of the book by highlighting the ambiguity of art’s object, and quoting Emerson’s characterisation of the scholar as, ‘him the past instructs; him the future invites’, and who here becomes the subject. Artist Scholar focuses on the role of writing in terms of art scholarship, but the author does not automatically equate scholarship with the conventional notion of research. Indeed he is at pains to acknowledge that the aim is not to deliberately bring PhD methodology into the MFA studio but rather to offer an historically grounded guide to encourage artist practitioners to engage critically with their work through writing. Chapter 1 provides a very readable and interesting overview of the relation between scholarship and research where the overall aim is to establish the concept that it need not, but nevertheless can be, an inclusive relation. The triptych of research types; pure, original and secondary is here used by Daichendt to create the foundation for his assertion that, through the development of a critical understanding of their own work, artists can better challenge traditional ways of thinking and thus validate their role in society where (in an amusing dichotomy that the author uses to make his own point) philosophy and gardening become the two polarised extremes. Chapter 2 again adopts an historical point of departure and in discussing the development of the US system against the background of the more established European context ensures that Artist Scholar can be of productive interest for readers both in America and in the UK. 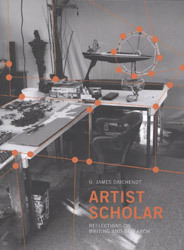 Daichendt equates what he calls the ‘institutionalisation’ of art practice within the university art department with the idea of art having become in the twenty-first century a ‘professionalised discipline that values the intellectual and philosophical over the craft and technical origins of art education’ (p.25). Professionalism, being a key concept here, is returned to further on. In Chapter 3, as a background to the development of the MFA in the US relative to that of the PhD in the UK, Picasso’s Guernica serves as a valuable example of the relevance and validity of the art process in terms of research. Following this, in Chapters 4 and 5, Daichendt turns from history to instruction as he guides the reader towards a shift in perspective as regards artists and writing, where strategies favour investigation and reflection over interpretation as the primary goals, and focuses on ‘reframing art practice as a mode of understanding’ (p.79). In conclusion, Artist Scholar is an interesting, and I would say invaluable read for all those involved in post-graduate arts education. Daichendt is not afraid to voice his own opinions but does so within the framework of a well-researched and lively text throughout which his passionate support for scholarship in the arts comes through loud and clear. Unfortunately the odd ‘typo’ and small, but not insignificant grammatical blunders could usher in a sense of irony given the nature of the argument, but as the writing is engaging and the subject itself is one that is very current, such accusation could be put down to editing and disregarded. The nature of the relation between art practice and art scholarship and its impact on how we deliver art education, will doubtless continue to be debated in university art departments both in the US and in Europe as new pedagogic strategies continue to develop in response to the current social and economic climate. In promoting the ‘artist’s voice’ and articulating the need for it to be encouraged and strengthened through research and scholarship Artist Scholar makes a substantial, and indeed revitalising contribution to this debate. Dr Jac Saorsa is Lecturer in Drawing: Teaching and Research, Fine Art at Cardiff School of Art and Design, Cardiff Metropolitan University.